Summary PAUL BLART MALL COP 2 is a US comedy about a mall security officer who travels to Las Vegas for a convention and stumbles across an art heist. 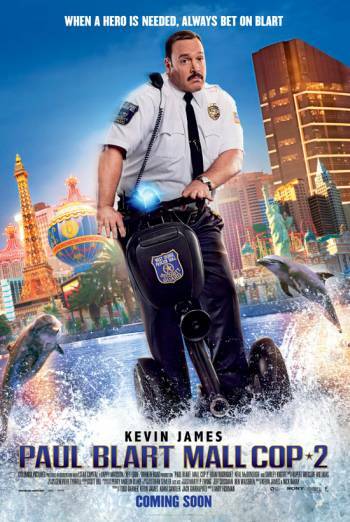 PAUL BLART: MALL COP 2 is a US comedy sequel about a mall security officer who travels to Las Vegas for a convention and stumbles across an art heist. There are numerous scenes of moderate comic and slapstick violence, including a man tumbling down some stairs inside a suitcase and knocking circus performers off their perches during a show. Characters are also shot at and one man is hit in the chest with a fork which has been connected to an electric cable. Characters are knocked out with tasers, hit over the head with vases, kicked or pinned to walls with expanding foam. One man also suffers an allergic reaction that leaves his face bloated and covered with lumps. Other issues include mild threat as characters are held at gunpoint. Company chose to remove a moment of moderate violence (a headbutt) and two sequences of weapons display (knives being opened and twirled) in order to obtain a PG classification. Cuts made in accordance with BBFC Guidelines and policy. An uncut 12A classification was available.